An A level in Classical Civilisation opens up the wonders of the Classical world without requiring students to understand an ancient language. It is wide ranging in its scope and provides give students a broad skill base necessary for future success. Comparing ancient and modern societies is fascinating and through this students gain a deeper insight into culture. As one of the most well-documented and diverse ancient cultures, the Roman Empire, at the time of its greatest influence, included places as diverse and colourful as Britain in the north, Egypt in the south, modern day Iraq, Turkey and Syria in the East and the Iberian Peninsula and Morocco in the West. Recognised even today as a pinnacle of intellectual thought and discovery, ancient Athens gave birth to democracy and sparked a cultural revolution of art and drama. Through Classical Civilisation, our girls can access the lives, minds and philosophical thought of men and women who lived over two and half thousand years ago. At A level, there are three principle areas of study: the World of the Hero; Greek Theatre and ‘Love and Relationships’. We explore what heroism means in the ancient world, experience epic battles and read some of the most influential and engaging literature ever written or composed. Studying the Odyssey and the Aeneid, we compare what heroism means to different societies and cultures. Greek Tragedy gives us the enthralling opportunity to ponder life’s most important questions through the medium of Greek drama and struggle with murder, mania, religious extremism and what it means to be human. The scandalous (and very rude) Greek comedy will offer some light relief. Finally, we study ‘Love and Relationships’. As well as gaining some essential tips on affairs of the heart from the scurrilous poet, Ovid, students also study the delights of the woman poet, Sappho, whose poems are as evocative now as they were nearly three thousand years ago. The courses explore both literary and material culture. Classical Civilisation is recognised as a very academic subject, which will provide students with a wide array of key skills. It also offers a huge variety of subject areas including philosophy, science, rhetoric, sophistry, architecture, history and some of the best and most influential literature ever written. The Classics Department has a history of excellent results, and offers a vibrant selection of extra-curricular activities. An A level in Classical Civilisation is a good complement for humanities or creative subjects. It is also a good choice for scientists who want to demonstrate skills in other areas too. Students will develop excellent communication skills, analytical and evaluative skills, the ability to synthesise a large amount of material and the ability to argue coherently and, crucially, to think outside the box. Assessment is by examination only. There is no coursework. Over the course, students will be assessed through essays, presentations, source analysis, practice questions and other suitable tasks. Geography allows students to study the world and our place in it. It bridges the study of the natural world with that of human behaviour, and investigates both in depth, as well as the relationship between them. For students who wish to comprehend the world better through first-hand field work, or study up close the effects of population growth and pollution, or comprehend fully how the earth itself was formed and continues to change, Geography is the right choice. In physical geography, students examine why our physical environments and landscapes appear as they are, how they form and operate, and how they inter-relate at various scales. Despite living in an increasingly modern and seemingly manufactured world, mankind will forever rely on the environment. Whether it is the ability to grow crops, the capability to stock-pile water or the power to pre-empt natural disasters, the study of our environment and the geography of the planet plays a vital role. Changes and stability in human and physical worlds, including the causes, rates and patterns of change and the prediction of change to the foreseeable future. Topics covered within the A level include water and carbon cycles, coastal systems and landscapes, and natural hazards. Geography also involves the study of human behaviour, and the extent to which this behaviour differs in regards to the environment. By studying the geography of a country, we can start to understand why certain cultures farm certain crops, or why a particular set of people design their houses in a particular way. By being exposed to a world of drastically different people, a budding geographer studies the rich tapestry of human life. Topics covered within the A level include global systems and global governance, changing places, and contemporary urban environments. Geographers also benefit from the powerful skills they develop through studying the A level. Students learn how to observe, describe, analyse, represent, interpret and report information about the world, and build valuable intellectual skills, such as critically evaluating theories and judging evidence in order to make informed decisions and to develop reasoned arguments. On top of this, students test their research skills, using a range of technical methods for the collection and analysis of spatial and environmental data, and undertaking fieldwork. For the A level’s non-examined assessment element, students carry out a geographical investigation which must include data collected in the field. The individual investigation is based on a question or issue defined and developed by the student relating to any part of the specification content, and involves a field trip to the Isle of Wight for data collection. For students who are already thinking ahead to potential university and career choices, it is worth bearing in mind that Geography is a broad based subject that develops the knowledge, skills and enthusiasm sought by higher education and employers. For example, for careers in sustainability and green issues, urban regeneration, energy supply, retail location, managing the effects of hazards and climate change, A level Geography is an obvious choice. History A level provides the two fundamental attributes required of a historian: a deep and enduring understanding of the past, and the capacity to identify bias and prejudice in sources. Today, with events that seemingly parallel some of the most challenging moments in our past, and a widespread perception that the information we can access is potentially tainted or ‘fake’, the skills and understanding given by History A level are essential. There is no greater means to understand the present, and to offer meaningful input into solving some of today’s challenges, then through learning about human history. There is no other subject that deals so well with identifying what is useful and reliable evidence and what must be sifted out, discerning what is credible and compelling from the myriad influences and voices around us. Historians are capable at evaluating the reliability and usefulness of material in order to better understand the contemporary world. Successful history students can write and sustain an argument, develop excellent research skills and can access a lot of learned content under pressure. They can reject unreliable sources and analyse reliable ones, often taking pleasure in independently reading around the subject in order to learn more. 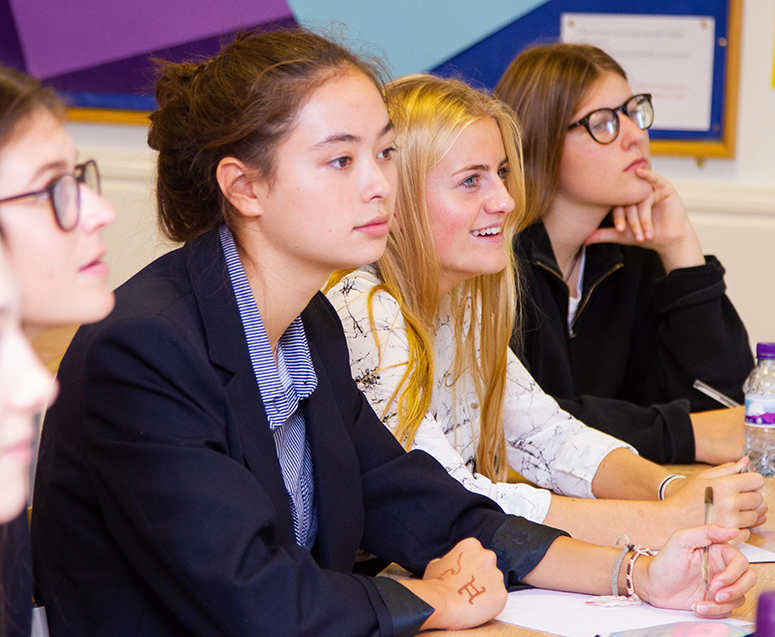 The History A level at Burgess Hill Girls covers a rich variety of fascinating subjects which equip our students with the tools of a historian, and a greater understanding of their place in history. The first year course covers post-war Britain as it changes from the ‘affluent society’ of the 1950s – when Britain apparently “never had it so good” – through the ‘Swinging Sixities’ and the “White Heat of the technological revolution”, to the social upheaval of the ‘Winter of Discontent’ that ushered in a new political dawn. The second year looks at what drove the actions of key political figures, including the ideas that defined the agendas of Thatcher and Blair, and the relative benefits and demerits of their policies. This was a time of race riots, miners’ strikes, the Falkland’s War, the creation of New Labour and endless arguments over Britain’s relationship with Europe. Our students end the course with a full understanding of how our contemporary social and political environment developed. The second half of the course covers the turbulent history of Russia from the collapse of the Tsarist regime to the brinkmanship of the Cold War. The events covered in this course had immense repercussions for world history, from almost giving Germany victory in the First World War, through launching the world’s first functioning Communist state, the horrors of Stalin’s Terror, victory in the Second World War, to becoming one of only two Superpowers in a new global order, confronting the US in a dichotomous struggle throughout the world, tinged with the threat of nuclear annihilation. 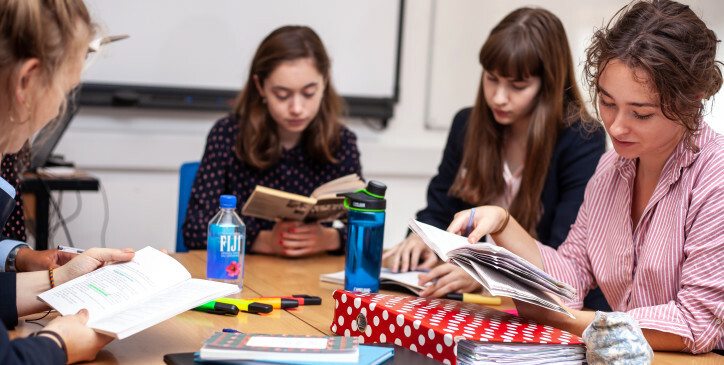 History is one of the most flexible A level subjects available, complementing many others, especially English, Classics and modern foreign languages. As well as providing the essential training for anyone seeking to become a historian, it is widely recognised as one of the most intellectually rigorous A levels, teaching a variety of skills that are easily transferable into many other subjects. Everyone is strongly influenced by her understanding of history. This is one reason why every student should consider studying the past: to comprehend the way it shaped the present both through what happened, and how we interpret it. A deeper knowledge of history will enable students to put contemporary thoughts and actions into contexts which make them more understandable. In short, the study of the past is at the centre of human enquiry. The enquiry is based the on Tudor Rebellions and is completed in the Upper Sixth year. Religious Studies A level is perfect for any student fascinated by big ideas, by the way people’s beliefs influence the way they live, or by sacred texts and their interpretation. Ideas, texts, beliefs and actions are at the heart of Religious Studies. It offers a wide and challenging syllabus that engages both the intellect and the emotions. It allows students to study different religions, and ensures that they have a thorough understanding of diverse philosophical and ethical viewpoints. The course allows students to investigate ultimate questions such as “why does evil exist?” and “what is the purpose of life?”, and study topics that explain the diversity of life and religion in the modern world. Students will improve their philosophical thinking skills and their capacity to understand and evaluate contemporary ethical and religious issues such as medical ethics and religious fundamentalism. All will develop communication skills and learn to clearly express their views, building their self-confidence. The course allows students to find answers for themselves, ensuring that they develop critical thinking skills, learn how to debate, assess the reliability of evidence and most importantly develop arguments using well-reasoned explanations. It fascinates and informs in equal measure, and offers exceptional preparation for later life. The course covers philosophy of religion, ethics and dialogues between Christianity and Philosophy. Students intellectually engage with topics such as proofs for the existence of God, various ethical theories and discussions of modern ethical dilemmas such as embryology, genetic engineering and weapons of mass destruction. In the ‘dialogues with religion’ paper, there are discussions of religious attitudes to gender and sexuality and the impact of the diversity of faiths in Britain. Through Religious Studies, students will gain the critical and evaluative skills sought by both higher education providers and employers – particularly in areas such as law, education, social work, finance, politics, medicine, administration and the media. Leading universities have made it clear that RS A level provides the necessary skills for preparation for university. Both Oxford and Cambridge University include Religious Studies in the top level list of ‘generally suitable arts A levels.’ For these reasons, it is one of the fastest growing subjects at A level. Religious Studies provides students with the opportunity to open their mind to new ideas, helping them to see the world in a new and exciting way.